Description: Shell conical, height to width ratio variable in range 1.8-2.5. Protoconch 2 ½ whorls. 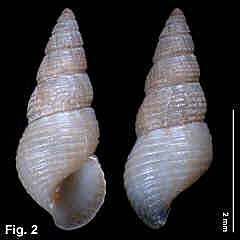 Teleoconch up to 6 slightly to moderately convex whorls, with sutures indented. Whorls sculptured with spiral ribs, 5-7 on third whorl and 6-8 on last whorl. Base with 6-8 spiral ribs. Aperture without siphonal canal; outer lip thin, flared anteriorly; columella smooth. Umbilicus sometimes present as fine slit. Colour pale yellow-brown to dark brown, usually with brown axial flames below suture which extend over tops of ribs forming series of disjointed dark spots. Operculum oval, corneous. Size: Up to 5 mm in length, commonly 3-4 mm. Distribution: Endemic to NSW; Port Stephens to Narooma. Habitat: Intertidal and shallow subtidal, on algae and seagrass in sheltered, often estuarine, conditions. Comparison: Separated form D. megapicalis by its protoconch of 2 ½ whorls, and strong spiral ribs. Remarks: Diala sulcifera sulcifera (A. Adams, 1862) occurs throughout the tropical Indo-West Pacific, extending down the east coast of Australia to Curtis Island, off Gladstone, Queensland. 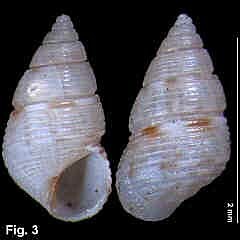 The subspecies Diala sulcifera scobina Laseron, 1950 occurs as an isolated population with a northern limit of Port Stephens, NSW. It can be distinguished from the nominate subspecies by its more elongate shape, wider interspaces between the spiral ribs and the presence of axial flames in the colour pattern.